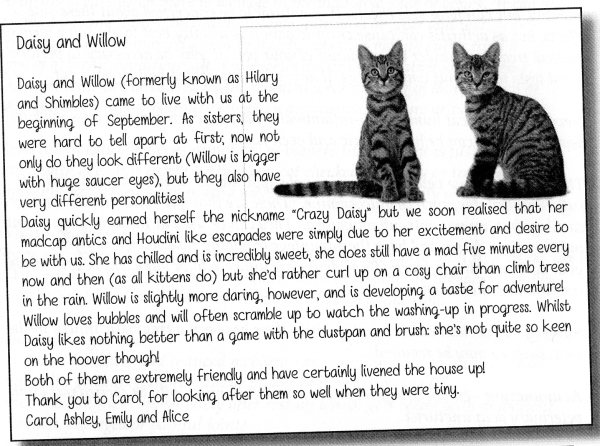 It is always good to hear about cats that have found happiness in their new lives. Many have had traumatic starts in life, but now feel settled and loved. Ben is a tabby boy. 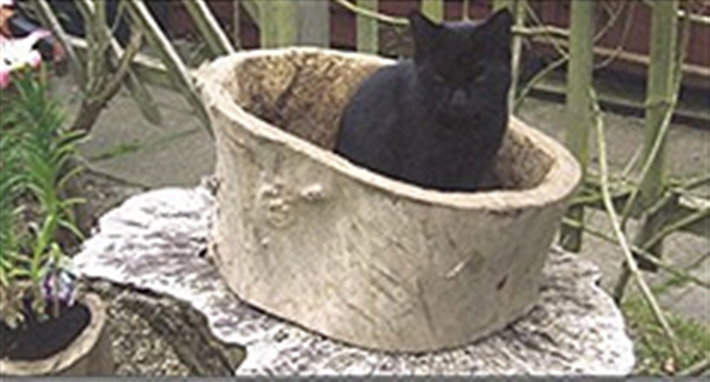 A call came from Framlingham Vets that a cat had been abandoned with them by the owner. The nurse mentioned that she had noticed some blood in his poo but that he seemed other wise to be fit and well. Ben quickly settled into his pen and started eating almost as fast as food could be provided. Thinking this was just caused by worms (very common with cats that have spent time away from home) he was treated for worms plus the usual flea treatment. Ben proved to be a lovable and affectionate cat who liked nothing more than to snuggle on ones chest and shoulder for as long as one could sit out in the pen in winter weather. All was not well, however, as it soon became clear that Ben had gastritis and was passing diarrhoea. There followed many trips and telephone calls to the vet, new drugs to collect, poo samples to deliver and blood taken for testing. Two or three times each day poor Ben had to suffer the indignity of having pills thrust into his mouth. This continued for three months and gentle though Ben is, a few scratches resulted as even Ben thought the treatment was too much and no antibiotic seemed to work. What to do? The only next step would be surgery to explore Ben's gut to see what was wrong but even then the treatment would be steroids which he was taking anyway. With vet bills mounting his fosterer decided enough was enough. Other cats and kittens need our care and it was decided to leave Ben on a special diet and look after him as best we could. Many evenings were spent cuddling him and pondering his future. Sometimes something good happens out of the blue. 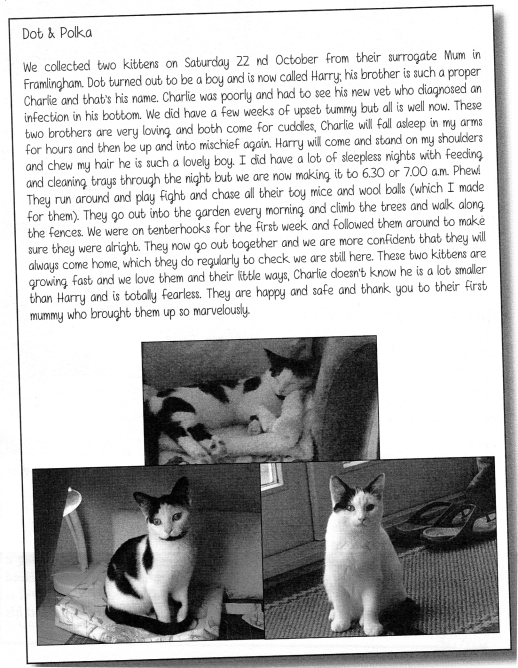 Celia came into Ben's life and offered him an indoor home in return for Cats Protection paying for Ben's special food and veterinary care arranged by Gillian. 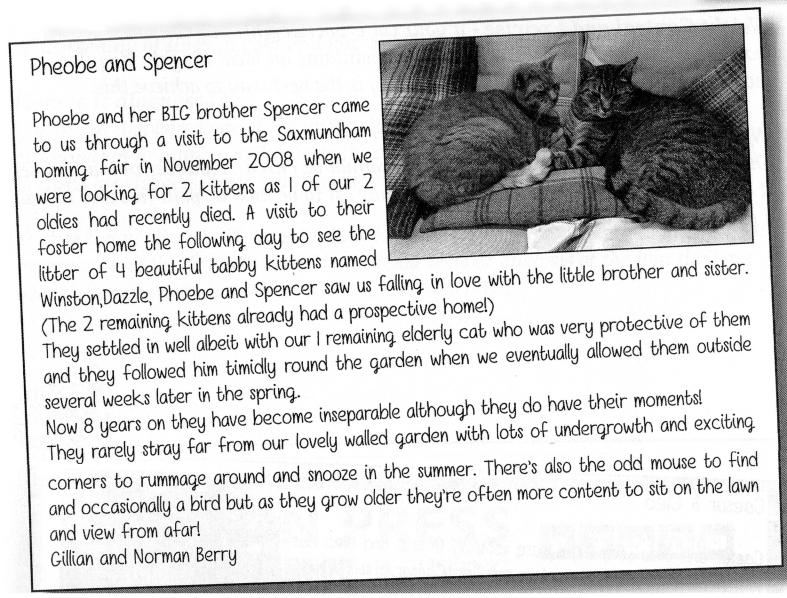 Months later and Ben is enjoying life in his home and Celia and Ben adore each other. He is a little thin but his gastritis is under some control although he does like stealing food left unattended. His fosterer calls to check on Ben and to reassure Celia who naturally is concerned to do her best for him. Cats like Ben need a great deal of care and need funding but the satisfaction of seeing a cat living the best life available is its own reward. Thank you Celia. Update to Ben's story 2017. Sadly, we heard from Celia recently that poor Ben had died. Celia was devasted to come home from work to find lovely Ben had died whilst she was out. 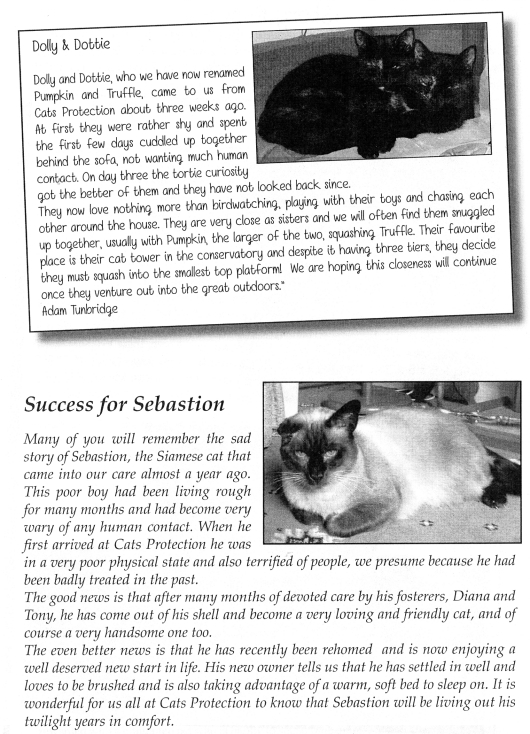 His former fosterers and all at Fram and Sax were heartbroken to hear the news, but once again thank Celia for the months she had with Ben which we know was a very happy time for him. We got our very adored and rather spoilt (by me!) 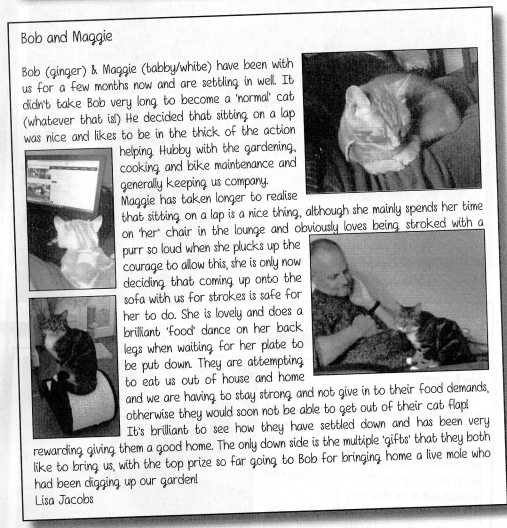 ginger and white kitten, Winston, from the Cats Protection in August 2010. I was 6 months pregnant with our first-born, and had just moved into a new home with a large garden which I considered to be cat heaven! I grew up on a farm and had many pets, and I wanted our son to grow up with animals as I feel having pets (ones that are allowed to use their natural instincts), an important part of childhood in order to develop a healthy respect for animals and nature. Being pregnant I had to be careful when handling or emptying the litter tray due to the risk of toxoplasmosis, but as I always wore rubber gloves (as common sense would dictate!) I was protected from any risk. When our son was born, I made sure Winston was never left alone in the room with him as he, like all cats, favours warm, cosy spaces - so the moses basket or the cot were again cat heaven! We also have to keep an eye on him when Winston thinks those little wriggly toes are little creatures!! Our son is now 7 months old and gives a big smile when he sees his puss-cat and hears his loud purrrrrrrrr. They are growing up being very fond of each other, Winston always rubs his head against our little boy and most evenings sits with us when I give the bedtime feed. For anyone who is pregnant or just had a baby, who thinks cats and babies do not go together, we are perfect proof that they do. 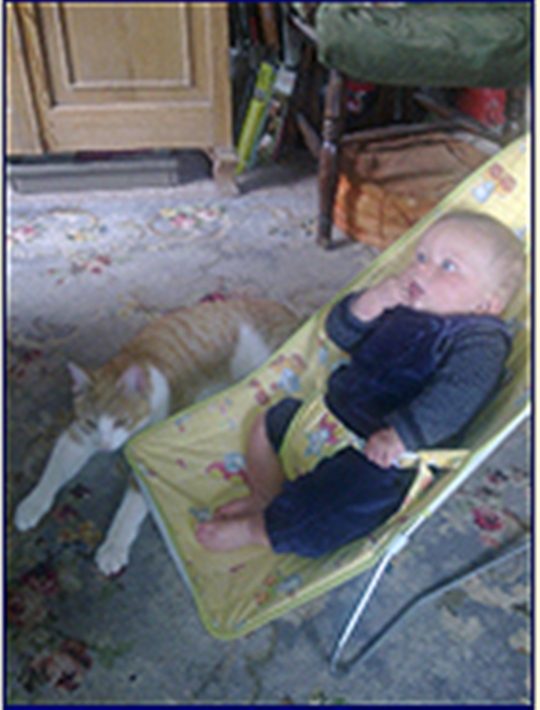 Yes, you have to be observant but cats and babies really are wonderful! Herbi - The Adventurous Gardener! 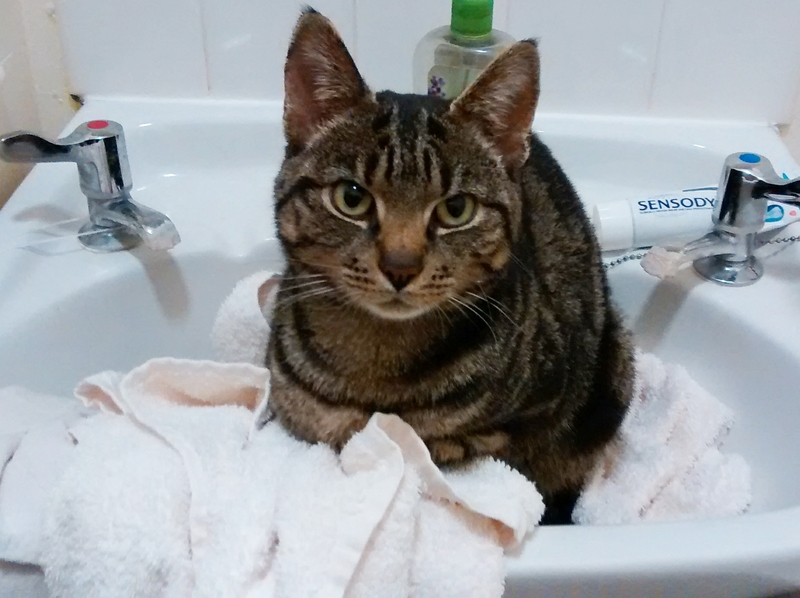 Hello, my name is Herbi, I am a CP cat and have been with my mum for almost four years. I know how to wind mum and dad around my paws to get my own way. Mum says she has to work to keep me in luxuries and pay my vet’s bill. Well, yes, I am a bit of a fighter when other cats venture into my garden. I really don’t see why they should think my garden is open to them, after all. I do help mum and dad dig, and I often rearrange the things mum has planted. If I don’t like some of the plants I just pull them up and take them indoors to her, so she can put them somewhere else. She says I’m being a pain. I think I’m being very helpful, no pleasing her sometimes. Thought you might like a photo of me just so you can see what I look like. I had come home with my toe hanging by a thread of skin, lots of blood and, of course, limping on three legs. Mum whisked me into my basket and we were off to the vet before I could make a fuss. The vet had a needle in his hand. I knew I was in trouble then. I might be a big boy but vets, needles in hand, turn me into a hissing monster. Mum held on to me and the deed was done. Next thing I know I’m coming to my senses and a strange lady is looking at me. I just yelled and yelled (I’m not very good with strangers). The vet phoned mum and asked if she would mind looking after me for the night and take me back as the first patient the next morning. He gave mum his mobile number to use if I took a turn for the worse in the night. He didn’t think I would as I am only three years old and very well looked-after. Everything went well and I slept all night and was ready for breakfast at 6.30am, only to be told I wasn’t allowed food, I had to be back at the vet’s by 7.30am. I let everyone know I wasn’t happy about that. Back at the vets to have my toe amputated. The day before was just to clean the wound and make sure nothing had been broken. Hours later, mum came to pick me up. That was the only time I didn’t make any fuss. When she put me in the basket I was so pleased to see her I purred so loudly everyone laughed at me and said I must be a mother’s boy. I had to visit the vet every day to make sure I didn’t get an infection in my paw. I decided I didn’t like the bandage, it had to go. I was very good, I didn’t pull the stitches out, just kept my paw clean with a gentle lick now and then. On the tenth day mum held me in her arms and the vet took the stitches out. I was on my best behaviour and he gave me a treat. He said it was for being brave. I was very glad to get out of there even though the girls said they would miss me, but they looked forward to seeing me in July for my yearly check-up. That means more needles and more yelling from me. I’m good around the house, although I did get a telling-off the other day. Mum was washing the lobby floor. I had been chasing the mop and somehow managed to tip the bucket over so we had a bit of a flood. I just made a hasty exit upstairs and nodded off on the chair in mum’s office. By the time I came down dad was home from work and made a great fuss of me and said he hoped I didn’t get my paws too wet. Mum says he spoils me. Someone has shouted that a cuppa is ready. That means a treat for me so will say bye for now, be good, just like me. Mum has said “ha ha”. Can’t begin to think what she means. Miss Fliss - Having a leisurely time! Here is a picture of Miss Fliss. She is adored and very happy with the Hawkins family. Despite her being a dainty little thing she has Max, the large family dog, firmly under her control! 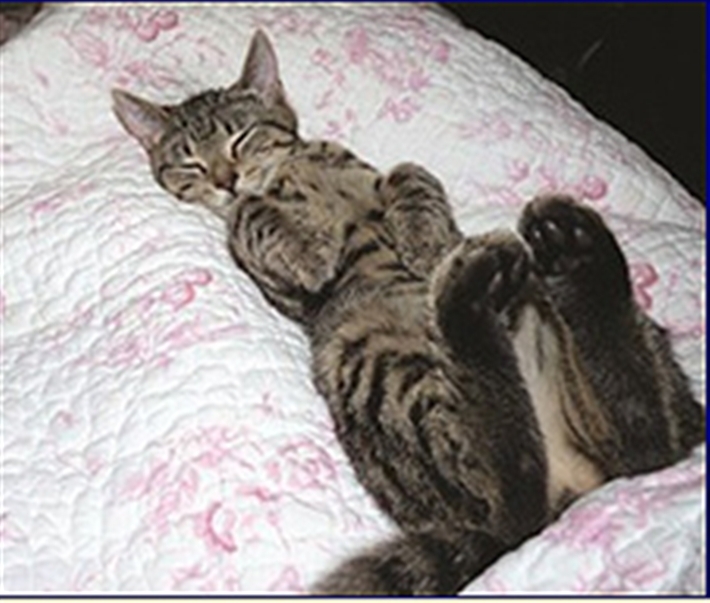 She is pictured here relaxing and taking it easy at home with her feet up!